Every preseason in the NFL, stars emerge. In all likelihood, these stars are highly-touted rookies, first-round picks or players who maybe even missed their first year in the league. However, on some occasions during the league’s preseason schedule, impact rookies come from out of the blue for the layman. Here at PFF, with our analysts grading every player on every play of every game at the NFL and FBS level, these players are not so out of the blue as one may think. After three weeks of the 2018 preseason, the Iowa product sits firmly atop the 2018 draft class with an elite grade of 92.2. 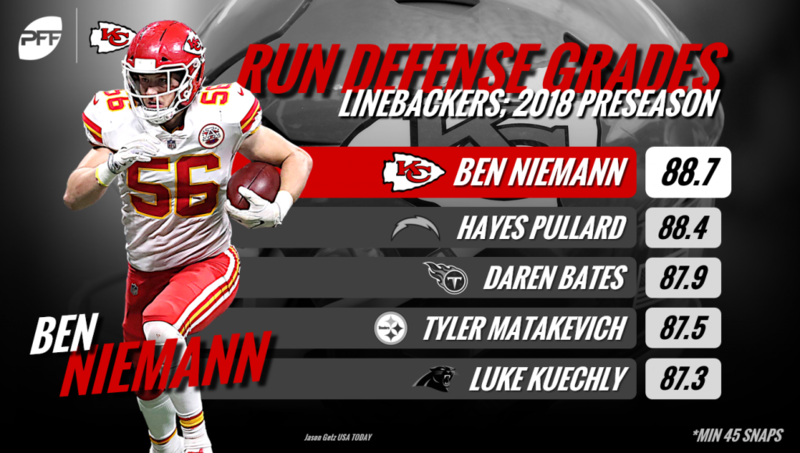 Niemann has been a standout player for the Chiefs defense so far, and he has found success in all facets of the game, but his best work has come against the run, where he’s racked up nine tackles and six defensive stops on just 38 run-defense snaps. To go with his excellent production against the run, Niemann has been targeted only once in coverage, and that target resulted in an interception. The undrafted rookie out of Alabama has certainly turned heads throughout the preseason and is well on the way to earning a place on the Redskins 53-man roster. In two games, Sims has logged 24 snaps in route and has caught five of his eight targets for 131 receiving yards, one touchdown and is currently averaging a whopping 5.46 yards per route run — the best mark among rookie wide receivers with at least 20 routes run. The most impressive aspect of Sims game action so far has been his production on deep passes, as he’s caught both targets of 20 or more yards downfield for 84 of his receiving yards. Through three weeks of the preseason, Sims’ elite receiving grade of 92.1 ranks first among rookie receivers with at least 20 snaps in route. The former Arkansas-Monticello pass-catcher has performed way beyond expectations on his 40 preseason snaps so far, and while he may not make the final roster this time around, he has shown flashes of his potential for the future and maybe even a practice squad spot in the desert. In three preseason matchups, Tolliver has caught 3-of-5 targets for 74 yards, and while that may not sound overly impressive, it’s important to note that all three of those catches have been contested by a defender at the catch point. Through three preseason games, Tolliver’s average of 4.35 yards per route run ranks second among all rookies with at least five targets. Celestin, an undrafted rookie linebacker out of Minnesota, has been a menace for opposing offenses in his three preseason games and has racked up eight total defensive stops so far, which is tied for the fourth most among rookie inside linebackers. Five of those stops have come on his 27 snaps against the run, which has resulted in a run-stop percentage of 18.5 percent — the second-best mark among rookie players at the position with at least 20 run snaps. In addition to his strong run defense, Celestin has also been stingy in coverage, as he’s only allowed 18 receiving yards four receptions, with just seven of those yards coming after the catch. Earning a spot on a team’s 53-man roster after joining as an undrafted free agent is an incredibly difficult thing to accomplish, but Holley’s last two preseason performances may have just helped him achieve that feat. Through three games, Holley has spent 33 snaps in coverage, where he’s been targeted four times and has broken up more passes (two) than he has allowed receptions (one). Holley has also been as sure as they come when it comes to tackling, as he’s not yet missed a tackle on any of his four attempts. The former Texas defensive tackle has been outstanding against the run so far this preseason, and through three weeks, he’s accumulated a whopping seven tackles and six defensive stops in run defense, both of which rank first among rookie interior defensive linemen. 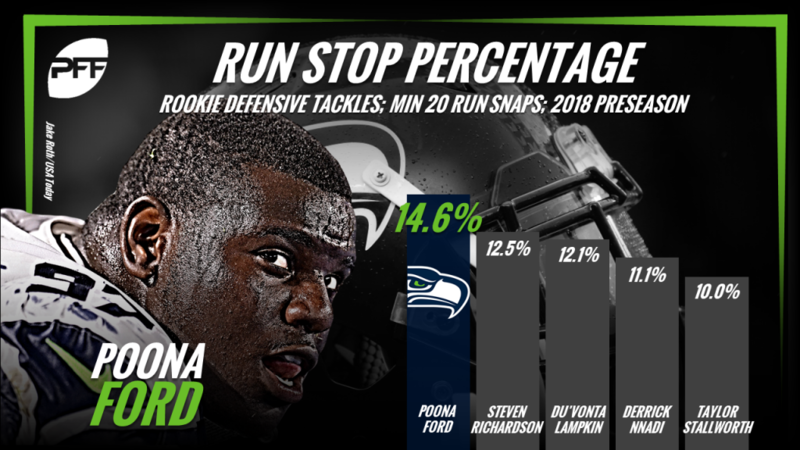 Add into the mix the fact that he’s also contributed two quarterback pressures on just 28 pass-rushing snaps, and it makes for a tough decision for the Seahawks brass on cut down day. Mark Barron and Cory Littleton are set to start at the inside linebacker spots in the Rams’ 3-4 defense but rookie Micah Kiser is making a huge push to be a part of that rotation. Through three games, the former Virginia linebacker ranks second among all rookie players at the position with 10 defensive stops, seven against the run and three against the pass. In addition to his stopping power, Kiser also leads all rookie linebackers with six total quarterback pressures on 11 pass-rushing snaps. The former Florida receiver has had a productive preseason so far and is potentially just one more good performance away from locking up a spot on the 53-man roster. Working exclusively out of the slot, Powell has led all rookie receivers in slot targets so far with 16, and he has caught 15 of those targets for 99 yards, 41 of which have come after the catch. His average of 1.80 yards per route run ranks eighth among 23 rookie receivers with at least 15 sot snaps, and his four forced missed tackles from the slot ranks first. Stroman heads into his final preseason game having played more snaps than any other defensive player on his team and the seventh most among all rookie cornerbacks in the NFL. In three games, Stroman has performed well in coverage, where he’s allowed just four receptions from seven targets for 44 yards, but he’s excelled in defending the deep ball, where he’s broken up a pass and not yielded a single reception on the three targets of 20 or more yards that were sent his way. After the Packers traded away backup quarterback Brett Hundley to the Seattle Seahawks on Wednesday, the chances are that former Eastern Kentucky signal-caller Tim Boyle will be kept on as the team’s third-string quarterback. Boyle has more than done enough to warrant the opportunity, as he’s played very well on his 24 dropbacks, completing 11-of-22 passes for 167 yards and two touchdowns. In his three games, Boyle has performed particularly well under pressure, where he’s notched a passer rating of 129.5 — the best mark among rookie quarterbacks. To say that Javon Wims has made the most of his opportunity this preseason would be an understatement. In three games, Wims has caught 15-of-20 targets for a league-leading 227 yards and has averaged an impressive 2.52 yards per route run, which ranks seventh among all rookie receivers with at least five targets. It’s likely that Wims has already earned a spot on the Bears’ roster, but with another strong performance in Week 4, Wims could very well find himself playing meaningful snaps when the regular season rolls around.